Hey friends 😃 Hope you are all having a great week. 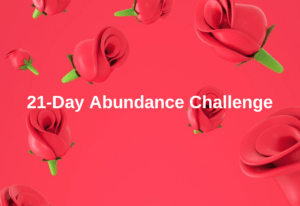 Today is your last day of the abundance challenge and on that note, I wanted to ask you a question: Have you heard about the 7 wealth activators? Keep your channels open so your energy can flow and stay tuned because next month’s challenge will help you to grow even more. This is your year. Your future is in your hands, you make it every day with your choices and decisions, in the way how you spend your time, the people you hang out with and how you feel every single moment. Write in the group or send an audio recording expressing your experience during these 21 days of Abundance (feelings, observations, what has changed, in short, a detailed description of your experience). Look back through your task notebook and read through all the tasks. Check if you have any gaps in the challenges or anything to add. Choose one person who you think is unhappy, that is continuously complaining about life and share with him/her the parable from task 19. Once done, write down in your notebook about how it went. Today’s motto: I share my positive energy with all beings. I attract positivity to myself. Reflect and write, in your task book or even better in the comment below this blog or post in the group, your impressions or reflections telling your experience. We are entering the home straight of our 21-day journey. Write down a letter about your home country on which you express all your feelings in relation to your country. The feelings you have are absolutely right and perfect. May you have a gentle and hopeful awakening in your work of self-healing, in your journey of transformation! Today we have a very special exercise! Make a detailed list of the things you have, material, spiritual, tangible and intangible. Example: I have a smartphone to communicate, I have credit to send messages. There is no upper or lower limit of what you should write … Recognize everything you have. I lead my emotion and choose to feel full, healthy, prosperous and blessed. Today’s motto: I accept myself and give myself permission for my thoughts, feelings, and expressiveness in terms of abundance. Make a list of things that you have pending to be done. Things that you wanted to do but left for later because you prioritized other things or even because you were worried about hurting others. The idea behind this list is to ask for forgiveness for not having done it. I, whole name, forgive myself completely and lovingly for not having done or finished my degree. I, whole name, forgive myself completely and lovingly for not showing my insecurities. Write however many phrases as you want, there is no limit. Today we celebrate what we have been able to afford so far, as well as our awareness of the abundance we experience every day and the openness to the abundance we desire and dream. Let us continue our inner work with dedication and love, with greater awareness of the infinite potential that we are and with the detachment to specific results of the process. Relying on the wisdom of uncertainty. Just know that what will come will be full of abundance. Make an appreciation letter to the person you think has hurt you at some point. ✳ If you have considered making a letter before, thus emptying all negative feelings with truths and words, do so. The important thing is that the moment you make the appreciation letter, try not to feel anymore the resentment against that person. Today think and meditate on who this person is. Several may come to mind, but we must do the work with only one. The letter must be written (handwritten). My whole being forgiven me and liberated me. Reflect, and write or record an audio file, referring to task 11, trying to see characteristics and patterns you have that resemble or relate to your mother or not. There are characteristics or patterns that we learn, others that are from our nature. ✳ you can listen at least once to the audio (if you recorded) describing your mother and reviewing the patterns or experiences that are repeated in your lives. Ask your mother what is the biggest disappointment of her life and also what is the one dream which remains unrealized. Record a voice file or write it down. ✳ if your mother has passed over, do a deep meditation and connect with her. Speak of your feelings through your heart. Today’s motto: I have all the capability to create what I desire.